The names 'Bristol' and 'Frazer Nash' were closely associated in the late 1940s, when both used the BMW-based straight-six engine from the old 328. Frazer Nash was the British agency for BMW (until 1959) and then Porsche until 1988 when the Stuttgart company bought the remaining shares. At the end of WWII, in 1945, the Bristol Aircraft Corporation considered getting into the car business. The company’s skilled workforce had spent six years building aircraft and the firm approached the Aldington brothers of Frazer Nash about a joint program. The brothers had sold BMWs under license before WWII and the two companies agreed to collaborate. In 1945, H.F. Aldington was still in the British Army. He visited the bombed-out BMW factory in Berlin and came away with plans, engines and Chief Engineer Fritz Fiedler. The factory was in the American zone and everything was supposed to be sent to the U.S., but the plans and materials were declared war reparations, and stayed in England. Bristol and AFN then parted company in 1947. The Aldingtons continued to build sports racers, while Bristol concentrated on road cars. 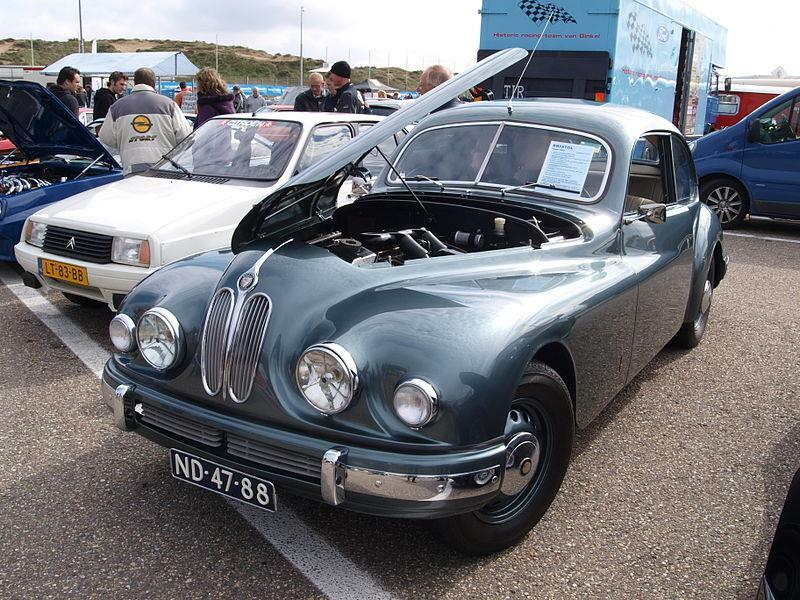 The 1947 Bristol 400 was a continuation of the prewar BMW 327 coupe, powered by the 80-horsepower, 6-cylinder motor that appeared to be a twin cam but actually had an ingenious system of crossed pushrods. It was pre-war in character and BMW evolved the design into the 501 sedans, the “Gothic Angels” that almost broke the company. The 400 had some sporting pretensions and 700 were sold in four years, until the aerodynamic 401 emerged in 1949. The wind-tunnel-tested 401 had lightweight superleggera construction, with aluminum and steel panels over an ash wood frame. The engine gained an extra 20 horsepower and top speed rose to 100 mph. A 401 also finished 3rd in the 1949 Monte Carlo Rally and 2nd in the Targa Florio. Bristol built 650 examples of the 401 and 281 of the 403 coupes between 1949-55, while there were just 20 lovely 402 dropheads. The cars were well-made and were a pleasure to drive but they came at a big price. A 1953 Bristol 403 cost about double the price of a Jaguar XK120 coupe. The 404 2+2 coupe arrived in late 1953. Called the “Businessman’s Express”, it was shorter and lighter, with 110 mph top speed. A full-width body abandoned the aerodynamic look and the BMW engine was tweaked to 105 hp. Only 52 were sold from 1953-56, and at least one drophead was built by Abbott. Succumbing to the 4-door diversion to which all sports car makers succumb, Bristol’s next move was the stodgy Bristol 405 saloon of 1954. A surprising 265 were sold by 1958, along with 56 pretty dropheads. Some saloons were bodied by Beutler in Switzerland. The company also supplied engines and chassis to Stanley “Wacky” Arnolt, the company’s U.S. importer, who had been selling Bertone-bodied bodied MG TDs. Arnolt had 404 chassis sent to Bertone, where they were bodied by a young Franco Scaglione. Faced with a tall chassis, Scaglione did what he could, but the result was not particularly beautiful. There were 142 built between 1956 and 1960, including five or six coupes, and at $3,995, the Arnolt-Bristol cost less than half the price of a 404. The 406 coupe of 1958-61 took a page out of Herman Graber’s design for the Alvis TD21, with an airy greenhouse, disc brakes and overdrive. The engine was bored out to 2.2 litres, and it was fairly successful, with 174 sold. There was a handsome 406 Zagato coupe, which boasted 130 horsepower and shed 450 lbs to be the fastest Bristol so far. Only seven were built, so good luck finding one. The classic Bristol would seem to be the timeless 401-403 series, which ooze elegance – exactly what the company was aiming for. Make sure the object of your affection is complete; replacement engines are hard to find and of course therefore very expensive.